2013 was California’s driest year yet and 2014 is looking no better. A firm-wide call for ideas from the San Francisco Office asked for videos addressing what landscape architects imagine for this environment in crisis. Watch the winners: Brittney Cooper’s “Brew Fields” (pictured) and Natalia Beard’s “Let Them Drink Wine.” Both designers are based in Houston. 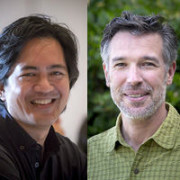 The Sausalito office currently has three pro-bono projects. Rubicon Courtyard, in Richmond, complements job-training efforts with a refuge for staff to decompress and privacy for counselor-client conversations. The theme of threshholds reflects the process of gaining independence. A gathering space for transitional residents at Novato’s OMA Village also provides a safe haven. 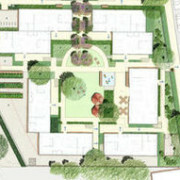 The Homeward Bound effort will feature a 14-unit housing facility and culinary arts job training. San Francisco’s Grattan Playground is a community-driven renovation of a beloved sanctuary promoting a sense of discovery throughout; it features terraced upper and lower yards with structures catering to different ages. SWA Dallas was one of five finalists. 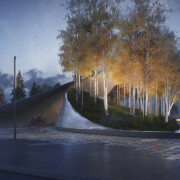 Rooted in the earth, the monument’s forms emerge from the landscape, signifying both death and renewal. 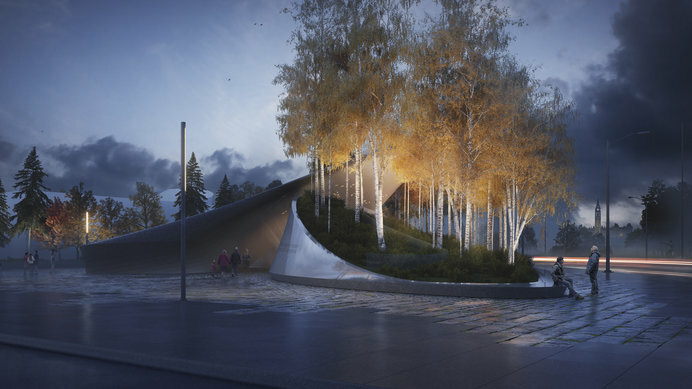 Birch trees and meadow grasses symbolize the common landscape between Canada and Eastern Europe and the deeper links of remembrance and responsibility. The Germans named the death camp Birkenau after the Polish village of Brzezinka, whose name stems from the birch trees found there. Forests offered Jews a place of refuge but they also served the perpetrators as a place of execution. The trees embody nature’s power of healing, regeneration, adjustment, and growth after trauma and symbolize the continuity of life, even through epic tragedy. Contributors: Quadrangle Architects and Terraplan Landscape Architects; artists Susan Phillipz and Yael Bartana, and Holocaust scholars Jeffrey Kerber and Deborah Dwork. Led by the Laguna Beach office, a Cal Poly Pomona studio generated work shown at the Rotterdam Biennale. Food for Thought proposes to work with the City of Vernon to develop a blueprint for a metabolic city that transforms and adapts its building blocks to grow, produce, and maintain its structure. The project additionally embraces the Los Angeles River in a location as yet unrecognized. 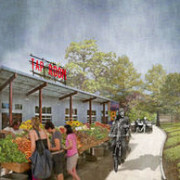 Food for Thought identifies a productive, technologically advanced, environmentally appropriate, and economically viable future in these connections. It also insists that industy employees are integral to their regional “food chain.” The project positions Vernon at the center of a discussion of justice, sustenance, distribution, energy, hydrology, toxicity, and the future of our cities. Click here to read about the LA Forum at the Biennale in Rotterdam. The Inner Mongolian city of Wuhai is transforming from focusing on coal mining as its main industry to tourism. This very special place has many different, beautiful landscape types located within just 1666 sq. 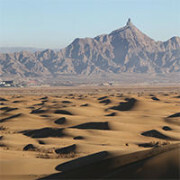 kilometers: sand dunes, mountains, and wetlands, plus adjacency to the Yellow River. Consequently, the city has decided to boost its tourism. Already planned is a lake flowing through the site, to be built off of the current Yellow River; but within 10 years it will have already lost 2/3 of its volume. SWA Group was hired to help design Wuhai’s marina on the new lake and also to help guide the city in its tourism plan. “A giant mixed-use project planned for the nexus of Chinatown/El Pueblo/Union Station is moving toward reality. Six developers submitted proposals to build a pair of projects hugging North Spring Street, North Broadway, and Cesar Chavez Avenue. The developments, currently called LA Plaza Cultura Village, could drop 384 apartments and 50,000 square feet of retail on two surface parking lots which the LA Plaza de Cultura y Artes, a nearby nonprofit, has the option to lease from the County. 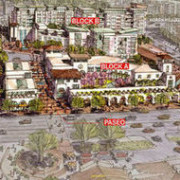 All that foot traffic and retail could be game-changing for the [lively-one-block-dead-the-next] area; equally enlivening to the plaza would be the east-west paseo packed with retail and helping connect pedestrian traffic from the pueblo and Olvera Street to the Fort Moore Memorial on the southern edge of Chinatown.” Report by Brigham Yen for DTLA Rising. Image courtesy of LA Plaza de Cultura y Artes. Yichang is a prefecture-level city located in the western Hubei province, People’s Republic of China. Lying on the northern bank of the Yangtze River, Yichang is the transportation center connecting eastern and western China. Its Juanqiaohe Wetland Park was designed to partner with nearby Moji Mountain Park, having complementary physical qualities and activities. 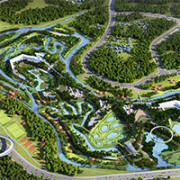 Together, the two parks create the Grand Park of Yichang and will allow visitors to experience a variety of landscapes. Reflected in the river, they appear as one. With sustainability a key driver, the planning area boundary of the Rancho Mission Viejo development was set as a response to intensive scientific and ecological studies of the ranch, reserving the most sensitive land for an extensive open space preserve. 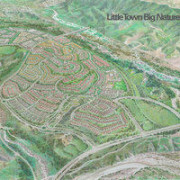 Embraced by this open space, canyons, creeks, and orchard, the second development phase (PA-2) is conceived as a California hill town built to serve a multigenerational array of homeowners blessed with commanding views and miles of recreational trails. 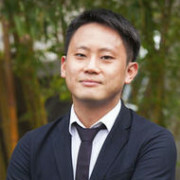 Aquino, former President of SWA, is an active designer based out of the Los Angeles studio. A longtime educator, Aquino has lectured extensively throughout the world and spoken at symposiums focused on infrastructure and open-space systems. He was named a Fellow of the American Society of Landscape Architects (ASLA) in 2013. Baumgardner has led the Houston office as Managing Principal since 2010. 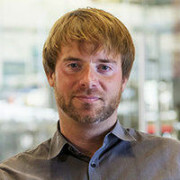 His recent work includes reenvisioning Downtown Houston’s Interstate 45 Corridor as a new public space, urban design for Fort Wayne’s River District, and a city-scale waterfront in Dubai that will become the region’s new financial hub. 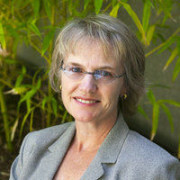 Baumgardner is active in the Landscape Architecture Foundation and is a regular speaker at ASLA conferences. The Tucker’s Point Club Hotel & Spa, in Bermuda, by the Dallas office, received a Merit Award from the Texas ASLA, while the Shanghai office earned an Honor Award for its Better Block Project. 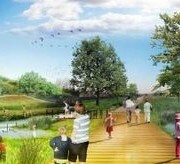 A NorCal ASLA Honor Award went to the Iron Horse Nature Park and Open Space Master Plan, in Dublin, CA (pictured), by the San Francisco office; the Sausalito office garnered three Merit Awards—for Sun City Yokohama, Weill Lawn and Commons, in Sonoma, and the University of California Davis West Village. Each year the Young Leaders Group of the ULI Orange County/Inland Empire district council honors the most outstanding local individuals whose contributions to their company and ULI make it clear that they lead by example. This spring, Andrew Watkins, an Associate in Laguna Beach, was awarded the 2014 ULI OC/IE Emergent Leadership Award in Architecture. Over this past year, Andrew exemplified the ULI’s mission “to provide leadership in the responsible use of land and to create sustainable thriving communities” through his practice, research, and pro-bono efforts. Sausalito Principal Elizabeth Shreeve spoke at three recent conferences about the health benefits and economic returns resulting from greater access to open spaces. Read about her investigation and the firm’s experience creating such places in this “Urban Land” article. Abstract: The professional practice of landscape architecture has never had a fixed definition. Rather, the practice grows, adapts, and evolves responding to global and regional limitations, opportunities and challenges. In today’s context of globalization, environmental problems have become increasingly interrelated and complex. Major crises include infrastructure failure due to rapid urbanization, mismanagement of rural areas, exploitation of natural resources, and the loss of relationship to ecosystems in the face of sweeping climate change. 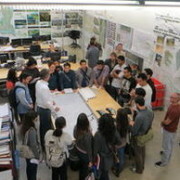 Tackling these challenges requires deep interdisciplinary collaboration, and it further redefines the realm and expands the body of knowledge of landscape architecture. Improvements for Evelyn’s Park in Bellaire?